Meeting in Bratislava without the UK, they will not discuss Brexit talks. What has the EU learnt since Brexit? 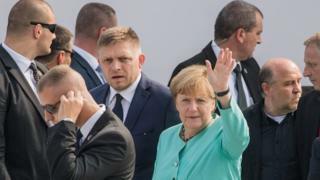 "We need solutions for Europe and we are in a critical situation," Mrs Merkel said as she arrived at the gathering. "You can't solve all Europe's problems in one summit. What we have to do is show in our deeds we can do things better in the realms of security and fighting terrorism, and in the field of defence." Even though the UK's referendum result is not on the agenda, and British Prime Minister Theresa May is not attending the summit, there is little doubt that Brexit will overshadow the meeting. French President Francois Hollande said: "Either we move in the direction of disintegration, of dilution, or we work together to inject new momentum, we relaunch the European project." An official close to European Council President Donald Tusk said the first session of talks had been "honest" and "frank". "But there were no attacks, so it was not about recriminating," he added. "There are underlying tensions and problems where the EU is not delivering solutions... We hope that the Bratislava roadmap can set a new direction for the next six months." The one-day Bratislava meeting is to be the first of several confidence-building meetings, where a new EU "roadmap" should be worked out. They will culminate in a Rome summit in March, when the 60th anniversary of the EU's founding Treaty of Rome will be celebrated. Donald Tusk is hoping for a public show of unity among the 27 nations of the EU following Britain's vote to leave in June. Mr Tusk wants to restore EU stability and credibility with the bloc in the face of a migrant crisis and issues with the euro currency. But European leaders are divided, their voters sceptical. Central and Eastern Europe want powers back from Brussels. Northern nations view the south as a eurozone liability. Mediterranean countries balk at German austerity edicts. So on Friday they will stick to subjects they agree on and those they feel are relevant to voters' concerns: migration, security and globalisation. Mr Tusk called on EU leaders to assure citizens they had learned lessons from Brexit and were able to "bring back stability and a sense of security". The EU response to the influx of migrants is one of the thorniest issues among members. The summit host, Slovak Prime Minister Robert Fico, is one of a group of central and eastern European leaders who object to the EU quota system which distributes 160,000 refugees across the EU. The scheme, for refugees from Iraq, Syria and Eritrea, is aimed at easing the burden on Italy and Greece. Mr Fico has said Slovakia will not accept "one single Muslim migrant" and has mounted a legal challenge to the scheme. On Tuesday, Luxembourg's Foreign Minister Jean Asselborn called for Hungary to be suspended or even expelled from the EU because of its "massive violation" of fundamental values, specifically the government's treatment of refugees. For France, the priority is border security in the wake of a number of Islamic extremist attacks in the country. Is Angela Merkel's political capital running out? France and Germany have outlined plans to deepen European military co-operation, which were reinforced in the State of the Union address by European Commission President Jean-Claude Juncker on Wednesday, in which he called for a European military headquarters. The UK's departure from the EU removes one of the biggest obstacles to stronger EU defence in tandem with Nato.